I fished a few creeks in Montana and quickly felt at home on the smaller water. Flows were low everywhere, an ideal time to gain access to the better holding lies. 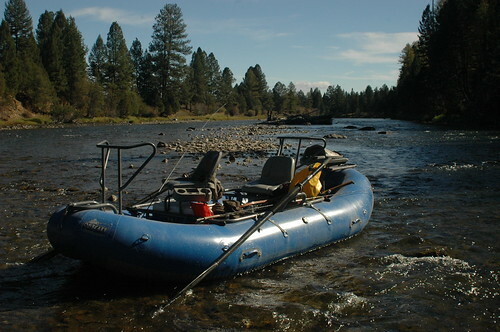 The first day I arrived, I was barely off the plane for 2 hours and we were rigging up on a small creek. This creek held mainly cutthroats and rainbows, which were quite aggressive. We hiked along a precarious ridge overlooking this small tributary of a much larger river. I fished up from the confluence, and quickly found some hungry cutthroats. 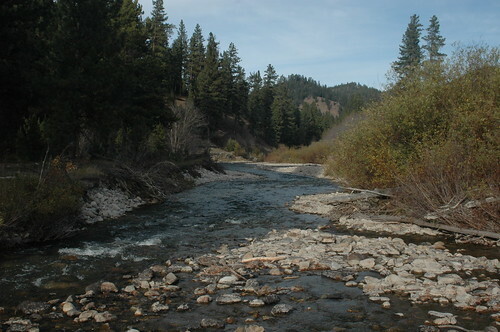 The fish were six to eleven inch West Slope Cutthroats. In the deep pools the water was so clear I could see the bottom down to ten feet. The fishing was just what I hoped for after hours of travel. The fish were easy to fool, and numerous. In about an hour and a half I landed a dozen trout before we headed back to Missoula. 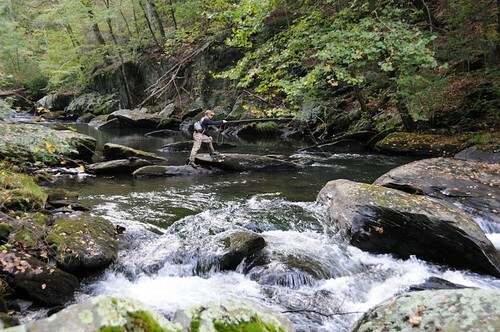 One of the more popular creeks, Rock Creek, was also one of the largest I fished. On my first full day I drove along many miles of Rock Creek (pictured above). I moved from section to section, targeting the best looking runs where the diversions all converged. I turned over rocks before fishing and noticed the rocks were covered with cased caddis and trico nymphs. I rigged a spun deer hair cased caddis and trico nymph to start. The first drift through a choppy riffle produced my first whitefish of the week. Numerous drifts yielded nothing, so I moved up into the best looking diversion. A dozen drifts and no strikes prompted me to switch both flies. I tied on a small rubber legged nymph, and sparkle pupa that worked well for me in Colorado. I stung a decent brown on the first drift. On the second drift I came tight to a bigger fish, which took line towards an undercut bank. I busted the 5X tippet trying to drag the fish away from the roots. 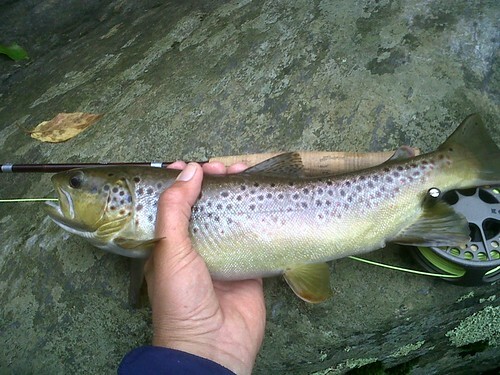 I did land one fifteen inch bow, and a small brown before moving up river. It took a few hours to drive up twenty miles of creek, taking photos and video. I stopped on the way back, fishing the best looking areas with tandem nymph rigs. 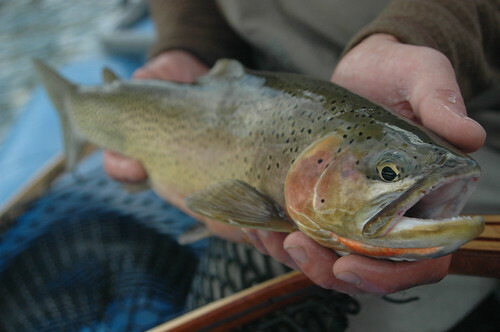 The majority of fish I caught were rainbows and browns between eight and sixteen inches. 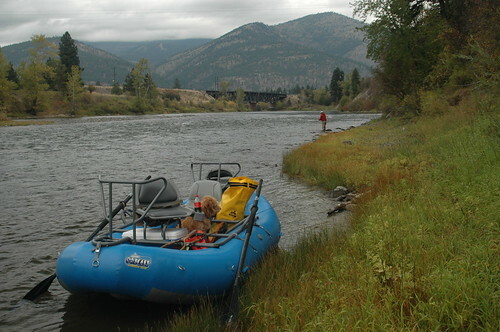 On the last day of fishing we picked a distant fork of a big river we floated earlier in the week. Matt and I were joined by Nick, who just flew in after a Summer in Alaska. 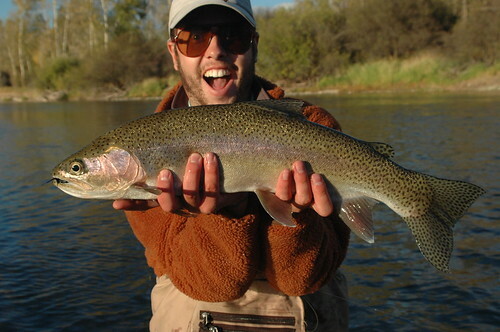 Our destination held the possibility of browns, cutthroats and rainbows of decent size in small water. This fork of the river was quite small, and shallow in most sections. We found fish holding in the deeper runs, and they quickly hit huge rubber legged nymphs and sparkle pupas. In a few of the better pools we rotated through, landing a few fish before the next one of us worked different flies in the same run. The day went by fast, and we all caught fish on some scenic water. The sun dropped behind the mountains, the air was cooler and the light was fading. I worked one last logjam with a streamer before putting my fly on the hook keeper. In that moment all the fishing possibilities of Montana ended for me, since I was flying out the next day. The week flew by, but there were moments and places not likely to be forgotten anytime soon. 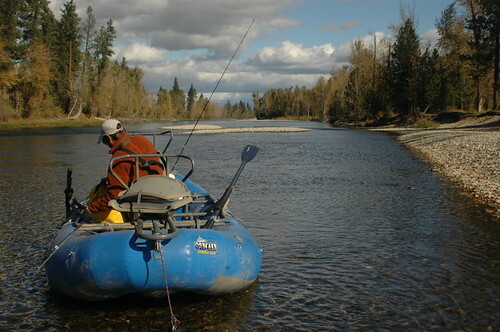 The latest video post features a mash-up of fishing smaller rivers and creeks in Montana. This entry was posted in fishing report, video on October 30, 2010 by Jason du Pont. The last float of my trip came after a few days wade fishing on my own. Matt and I drove a short distance from his house to the Bitterroot River. The weather had changed, and air temps dropped ten degrees from the previous days. The wind blew hard, pushing clouds across the sun, casting us into ten minute intervals of cold or warmth. The trees along the river were a bright yellow against the gray mountains, and the river, as silver as a mirror. 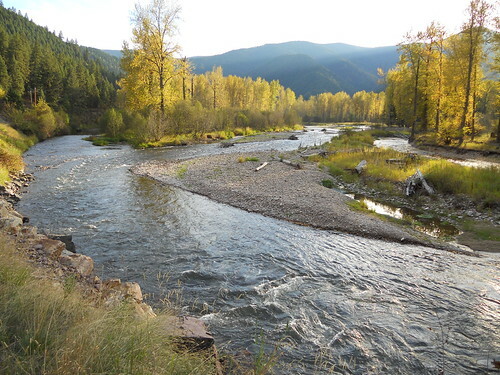 This section of river had good numbers of big browns, and I felt confident fishing one particular streamer pattern. We both had nymph rigs ready, but I fell into cast-and-strip mode, almost second nature after numerous days streamer fishing. One bank in particular was known to hold a lot of trout, and I watched trout spook from the shallows as we approached. A few passes with the streamer brought mainly chases, and one light hit. We saw quite a few big browns, so we pulled off to wade for ten minutes. I missed the first good hit of the day, caught off guard in between strips. Twenty minutes later, I cast into a riffle where the rod was quickly jerked down before a big brown shook the hook on the surface. The strikes for the most part were subtle, a slight resistance on the line. Cast. Strip. Pause. Strip. Swing. Bump. Was that bottom, or a take? Throw in a few big Pike Minnows, and there was enough action to keep things interesting. We changed from streamers to nymphs, and took turns at the oars. We fished a variety of rubber legged nymphs, big and small. I even drifted some tiny size 20-22 BWO and trico nymphs. I noticed thousands of the tiny nymphs crawling and swimming over the river bottom. I kept switching back to the streamer when nothing else produced. I was rewarded with a decent rainbow, and Matt mentioned they get huge in this section. It proved to be a bit of foreshadowing. After fishing for a while I offered to row, and Matt took the bow. He fished a hopper/mahagony dry combo along the banks until he got snagged on a submerged stick. I passed off the streamer rod, and he started casting into some great looking oxbows. One oxbow was filled with fallen trees, and deep churning water. I looked up just as the rod bucked violently, and Matt yelled, “Big fish!” I could see a large fish thrashing on the surface as he slide the big rainbow to the net. It was his biggest rainbow of the Summer/Fall, measuring 24 inches. Once he released the rainbow, I walked up to the head of the run. On the first cast I had a good hit, and on the second cast I landed a cutthroat. 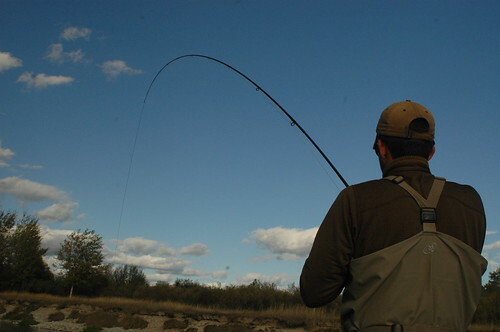 We moved on the towards the take-out, fishing the streamer in deep pools. The river changed dramatically from wide sweeping riffles into deep, narrow sloughs with a lot of woody debris. We covered many miles of river, and only stopped a few times to wade. The sun was setting as we reached the take-out. The day was similar to the other days where the river yielded quality fish over quantity. In this video post I filmed floating on the Bitterroot River. This entry was posted in fishing report, video on October 23, 2010 by Jason du Pont. After a deluge today the river is low, flowing at a placid 33 CFs, and clear. Dry Fly purists rejoice! Small caddis, BWO’s and a midges have accounted for most of the catches in the catch and release section this week. 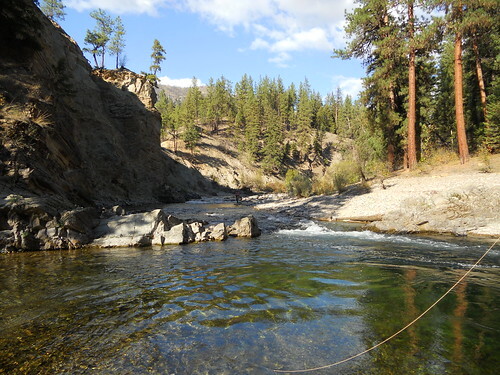 The upper river has been low for some time now and the fish are; tired of hiding, hungry and looking up. If you’re calling in sick tomorrow, you’ll still need some measure of stealth and 7x-and be sure to wear sunscreen so you won’t tip the boss off. If long leaders and tiny dries just aren’t your thing, reports that the lower river, from the Gas line downstream to Phoenix Rd being stocked today have been confirmed. The Gunpowder River at Glencoe Rd is moving right along at 97 Cfs as it is also influenced by Little Falls below Bluemount Rd. It should be clearing and dropping by Friday. Streamers anyone? Haven’t been to the shop in awhile but I did get out this past Sunday and fished a section upriver from the Masemore parking. After fishing the river for nearly 20 years I sometimes forget how beautiful and productive the Gunpowder is. As you know the water is low, clear and cold so I fished about a 14 foot leader with the last 18 inches stepping down to 8x. With nothing rising on the surface I tied a size 24 Bluewing, found a fast riffle that went over a two foot hole and casting up stream, skated the tiny fly over and around the deep area. I stayed there for about 2 hours landing some of the nicest fish I’ve gotten into this year. Once again I lost track of the numbers I caught, most were in the 7 -9 inch range. But I did catch four memorable trout, all browns and all in that 12 to 14 inch class. Fat and wide they made me work to keep the 8x from breaking. When I was done I looked around to take the end of the day beauty in and left thankful for having a river like this so close. This entry was posted in fishing report on October 14, 2010 by Theaux Le Gardeur. Last week Backwater Angler hosted a crew from Emmy award winning MPT, (Maryland Public Television) in the shop and on-stream for an upcoming Outdoors Maryland video segment. Pictured from left are: Jeff Lewatowski, Christy Neale, (who, as an associate producer brought home an Emmy in the Chesapeake Heritage category for Eatin’ Crab Cakes: The Best I Ever Had) Brandon Huse, Theaux Le Gardeur, Mark Burlet and Goldy. The water level had just dropped that morning leading up the the annual DNR shocking survey so conditions were a little tough. We managed to fool a few fish in front of the cameras using small caddis, blue winged olives, a few pheasant tails and a rather large snowshoe Cahill in the boulder pools. This entry was posted in news on October 12, 2010 by Theaux Le Gardeur. By now most anglers in the Old Line State have hopefully heard of Didymo. Based on a few local fishing reports, now even snakeheads may be considered passe. Global warming advocates have a lot more to talk about since a Red Oscar was caught in Pretty Boy Reservoir and a Peacock Bass was caught in the Monacacy. These catches may well signal the tip of the melting iceberg. 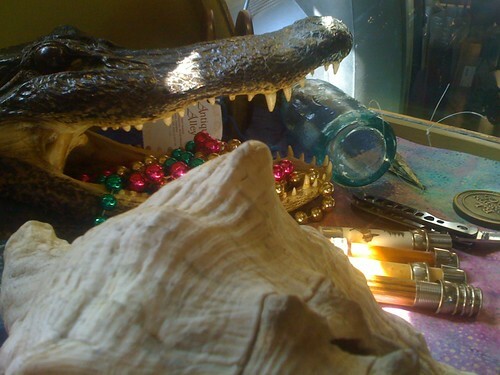 Could we be that far away from stepping lightly over alligators? I spent yesterday on the lower Gunpowder Falls from 11 AM-5 PM. Cool and very cloudy…barely reached 60 and the water was low, clear & 56. Only significant hatch was a little #18 Paraleptophlebia mayfly–brownish bodies with med gray wings…they hatched mostly in mid afternoon. There were also a few of the pure gray Baetis blue winged olives #20 hatching from late morning until I left ~5 PM. 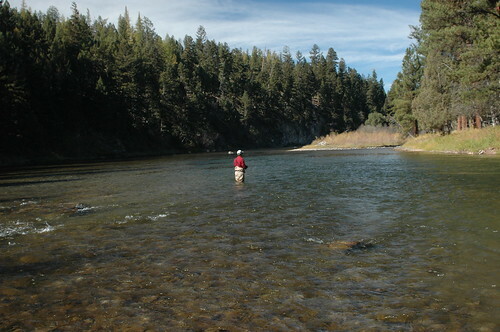 But fish would pounce on almost any buggy dry fly. Nothing bigger than ~9″….maybe a dozen landed all together, with another 6-8 LDR’d… Beat a day on the PC! Had hoped to see a hatch of slate drakes (Isonychia), but only saw one float by all day. I saw mostly sporadic rising all day…even when there were modest number of the Paralepts on the water. Best fly was a brown bodied, natural winged bucktail caddis #14. Had no hits on a chartreuse inch worm….! 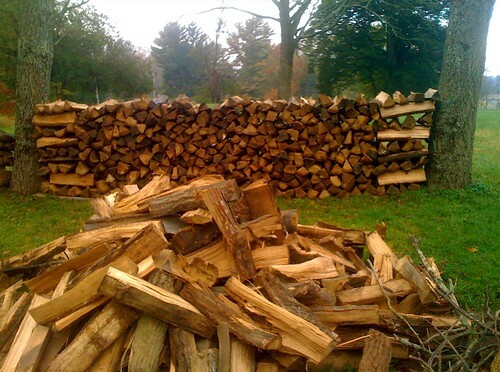 If you’re not stacking firewood this Columbus Day weekend, try a little fly fishing on the Gunpowder! 8 AM till 4PM on Saturday, Sunday and Monday. This entry was posted in fishing report on October 8, 2010 by Theaux Le Gardeur. Please join us for a flyfishing school. On Sunday, October 17, a Backwater Angler Guide will be teaching a fly fishing school that is ideal for beginners. If you’re planning on fly fishing in Maryland, or anywhere else for that matter, this course is a great introduction to the sport. The school covers knots, casting, gear, fly selection and an hour of on-stream instruction. Schools are held in a meadow overlooking the Gunpowder river by a Maryland state licensed and insured fishing guide. Class is held from 9:00 AM till 12:00 PM. Cost is $100 per person and includes the use of gear. A Maryland Non-tidal fishing license and trout stamp is required and may be purchased prior to the class with check or cash at the shop. Class size is limited to 4 and pre-payment is required. Please give us a call at 410-357-9557 or drop us a line at info@backwaterangler.com to register. This entry was posted in events on October 7, 2010 by Theaux Le Gardeur. The gunpowder river is flowing at 31 Cfs, is 54F and is gin clear. Tiny olives are still making their presence known. The river is quite low so if you’re wading waist deep you’re surely stepping on fish. Small nymphs are making the difference for a lot of folks out there. Using an Adams as a searching pattern is a safe bet. Thanks to Mick Magill for the photo and stream report. I worked the area you suggested. This 15-incher took the # 22 zebra midge you also suggested – scraping the bottom. Need help out there? We’re happy to assist. Feel free to stop in the shop the next time you’re up on the river. This entry was posted in fishing report on October 6, 2010 by Theaux Le Gardeur.